I guess this week I will really enjoy even more the fact that I can walk to work and don’t have to rely on public transport. Since today, 18h00 Metronet, the company who maintains part of the London Underground network will be on strike for 72 hours. 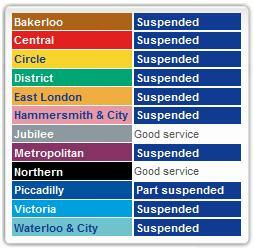 As a consequence, only 3 of the 12 lines are still operating! During peak hours, with all 12 lines in service, the trains are already rather packed, now imaging that with only 3 lines in operation! I don’t even want to think about the situation in those areas which are not covered at all by the remaining lines. The cabbies will definitely have a few busy days in front of them.